The SkyScanner 100mm table top reflector is a perfect starter telescope. It is large enough to view night sky objects such as the Moon, planets, and bright nebulas and star clusters, yet compact enough to sit on a desk or store in your closet. 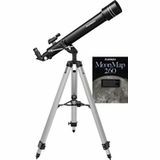 The Observer II 70 Altazimuth Refractor is delightfully easy to operate, and its affordable price makes it a great telescope to start with as you discover the rewarding hobby of amateur astronomy. Includes the Orion MoonMap 260! Online or in your mailbox. Please send me email about sales, new products, and astronomy. By signing up for email, you agree that Orion has the right to use your data for such purpose. 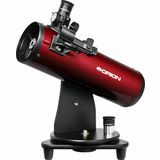 Orion offers telescopes for every level: Beginner, Intermediate, and Advanced. From our entry-level beginner telescopes for amateur astronomers to our Dobsonian telescopes to our most advanced Cassegrain telescopes and accessories, you can find the best telescope for you. Because we sell direct, we can offer you tremendous value at a great price. Not sure how to choose a telescope? Orion's Telescope Buyer's Guide is a great place to start. At Orion, we are committed to sharing our knowledge and passion for astronomy and astrophotography with the amateur astronomy community. Visit the Orion Community Center for in-depth information on telescopes, binoculars, and astrophotography. You can find astrophotography "how to" tips and share your best astronomy pictures here. Submit astronomy articles, events, and reviews, and even become a featured Orion customer!